When you think of music games on iOS devices it’s hard to look past the Tap Tap Revenge series and titles such as Guitar Hero. This could be about to change as Com2uS; perhaps best known for their Hall of Fame inductee Homerun Battle 3D, are set to release a new game in the coming weeks. This new title offers unique gameplay over two modes – DJ and Drive – as well as giving you the option to share your own creations. In DJ Mode a selection of different notes, each surrounded by a glowing ring, appear in various locations around the screen. When the glowing ring becomes the same size as the note you must tap it to score points. Notes come in four distinct varieties, all of which must be mastered if you want to achieve a big combo and ultimately a high score. Standard Blue notes are the ones you’ll see the most during play and require just a simple tap, with yellow notes requiring you to tap and hold the screen. Green notes require you to tap and drag your finger along a designated route, whilst pink notes must be hit several times before they disappear. Successfully hitting notes will fill up your Fever Gauge which provides more points and extra combos, similar to Star Power in Guitar Hero. Drive is the game’s second mode and my personal favorite, which must first be unlocked (by getting a score of at least 3 “Bs” in Normal difficulty) before it becomes playable. 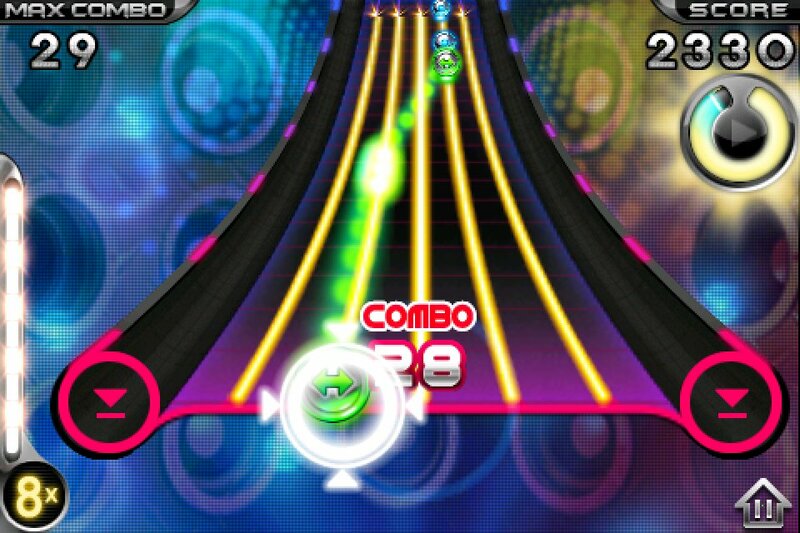 Gameplay in this mode is a lot more reminiscent of Tap Tap Revenge than DJ Mode, but still has its own unique twist. Using your device’s in-built accelerometer you must move a ring from left to right colliding with notes as they fall from the top of the screen. After a song is completed your total points will be calculated and you will receive a number of stars, plus a rank based on your performance. This is then added to a global leaderboard, but can also be posted to social networking sites for your friends to see. 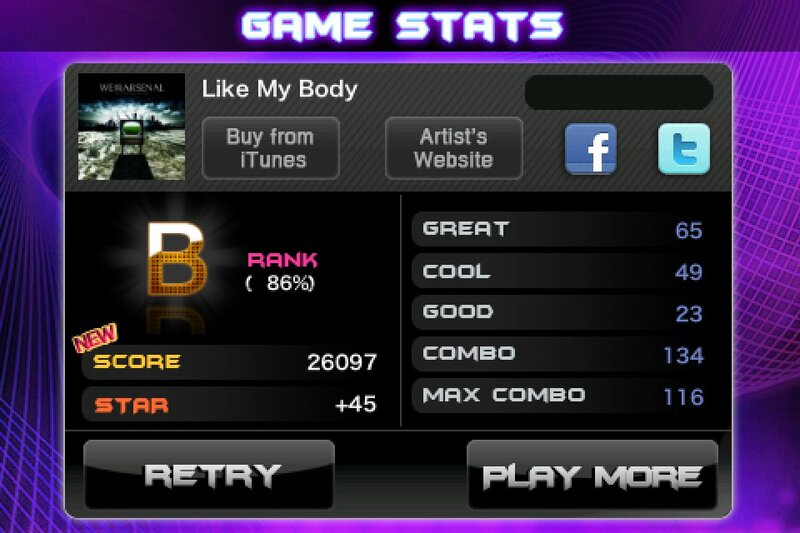 If you become bored with simply playing the song included with the game, you can try your hand at creating your own taps from songs in your iPod’s library. This is a pretty simple process which involves tapping, multi-tapping and swiping to create the four notes that you will have come across during the game. After finishing your creation, you can either play through it yourself or upload it for other players to enjoy. This is done via the apps in-built store, where you can also download other players taps with the stars that you have earned throughout. Due to obvious Copyright issues only created taps are downloaded and not the actual media, meaning you must have the corresponding song in your library to play it. I was able to get my hands on a Beta release of Touch The Beat and although it supports both leaderboards and achievements, it doesn’t currently use any of the social gaming networks available to iOS users. The inclusion of Game Center to handle these would be welcome addition, especially if it brought matchmaking and competitive multiplayer options with it too. Although you can create your own, the game currently contains only a limited number of songs to play through. Hopefully the game’s full release will include a slightly wider selection of tracks to master. I don’t currently have a release date for this game and Com2uS have told me that the final price of the app is yet to be decided. 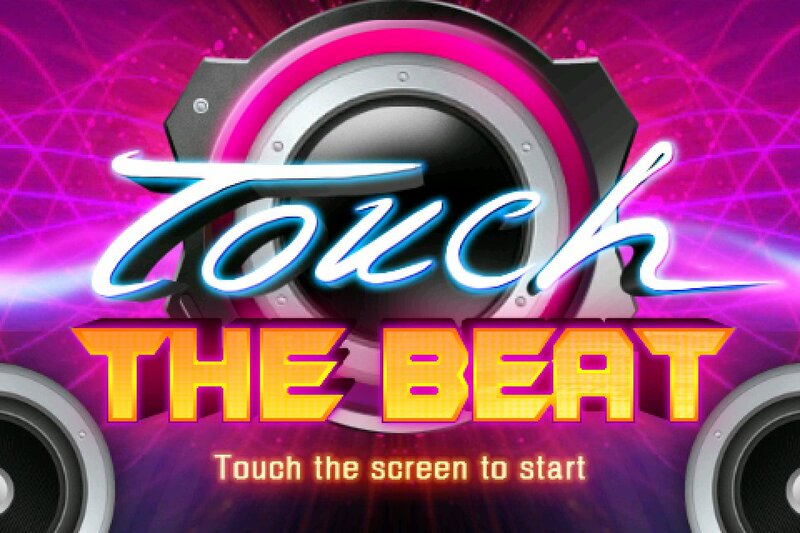 As Touch The Beat adds some much needed varitey to the world of music games, it’s definitely worth keeping an eye on the app store.